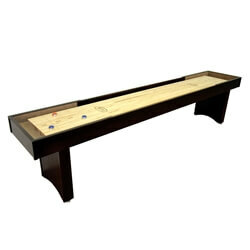 The Competitor II Shuffleboard Table is a classic design with the best value in the industry. The Competitor Shuffleboard features a solid hard maple cabinet available in Chestnut, Mahogany, Mocha and Cinnamon standard finish colors. 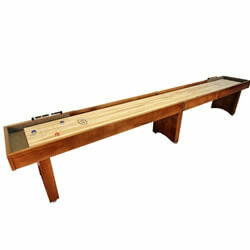 You can also have your competitor shuffleboard table custom finished in a color to match with your decor. The cabinet wood is the same hard maple that we use to build the butcher block 18" wide 2" thick hard maple play-surface. 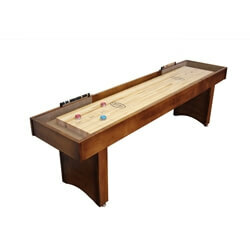 All McClure Shuffleboard Tables come standard with a lifetime warranty traditional finish. Your Competitor II Shuffleboard comes complete with 8 pucks and 1 can of shuffleboard wax powder. Optional additions include a traditional or electronic scoring unit in a matching finish. 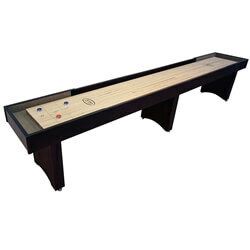 Customize with a company logo or graphics or add accessories for your shuffleboard table at checkout. McClure Tables shuffleboards are built with the highest quality local materials and old world craftsmanship. Made in America hand crafted with pride at our Grand Rapids, Michigan facility.